The Cure have played many festivals this summer and many of those have been shown on TV (or via web-casts) and, inevitably, have made their way onto YouTube, Vimeo, etc. 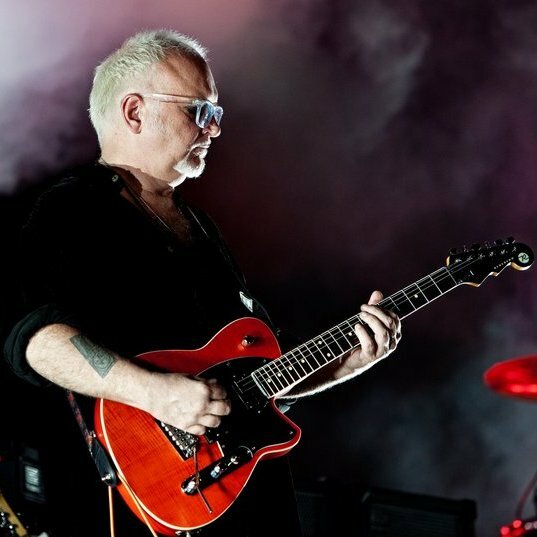 And with Porl Thompson’s departure from the Cure earlier this year, there is a new “guest” on the tour in the form of Reeves Gabrels. Reeves has played before with the Cure, playing guitar on the 1997 single “Wrong Number” (and there are several other collaborations between Robert & Reeves). You will probably know Reeves as part of Tin Machine with David Bowie. Reeves has an edgy, gritty guitar sound, and it really adds something to the sound, and definitely different form Porl’s more psychedelic sound. Audio only versions of many of the festival shows are available on the Summer Cure 2012 blog. Friday I’m in Love, Doing the Unstuck, Trust, Want, Wrong Number, One Hundred Years, Disintegration, Lovecats, and some of Close To Me. Plainsong, Pictures of You, High, The End of the World, Lovesong, Push, In Between Days, Just Like Heaven, From the Edge of the Deep Green Sea, The Hungry Ghost, Play for Today, A Forest. Open, High, The End of the World, Lovesong, Push, Inbetween Days, Doing the Unstuck, Just Like Heaven, From the Edge of the Deep Green Sea, If Only Tonight We Could Sleep, Pictures of You, Lullaby, The Caterpillar, The Walk, Bananafishbones. Open, High, The End of the World, Lovesong, Push, In Between Days, Doing the Unstuck, Just Like Heaven, From the Edge of the Deep Green Sea, Pictures of You, Lullaby, The Walk, Bananafishbones, Play for Today. Open, End of the World, Lovesong, Push, Inbetween Days, Just Like Heaven, From the Edge of the Deep Green Sea, Trust, Want, Pictures of You, Lullaby, The Walk. Robert Smith solo (during technical fault): Three Imaginary Boys, Fire in Cairo, Boys Don’t Cry. The Cure: Open, High, The End of the World, Lovesong. Sleep When I’m Dead, Push, In Between Days, Just Like Heaven, From the Edge of the Deep Green Sea, Want. Plainsong, Pictures of You, Lullaby, High, The End of the World, Lovesong, Mint Car, Push, Inbetween Days, Just Like Heaven, From the Edge of the Deep Green Sea, Trust, Want, The Hungry Ghost, Wrong Number. Push, Inbetween Days, Just Like Heaven, From The Edge Of The Deep Green Sea, The Hungry Ghost, Wrong Number.